Easily visualize your goals, progress and status! The SharePoint KPI field type enables you to better visualize your targets and current status by allowing you to display key performance indicator icons and progress bars in your SharePoint lists/libraries and web parts. 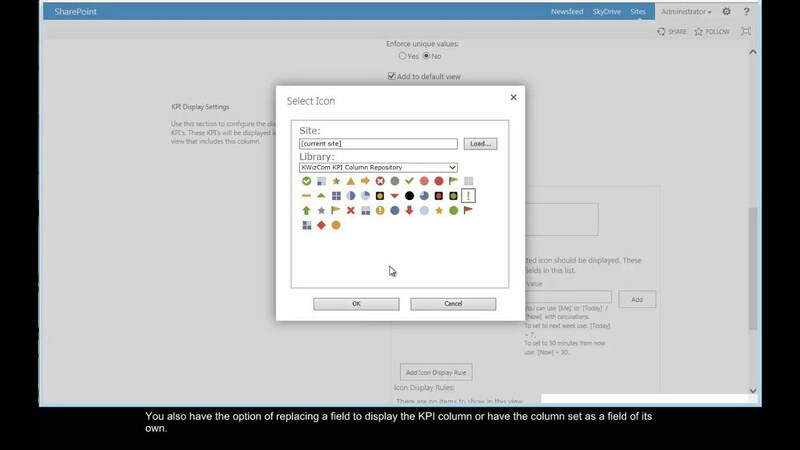 Each KPI Column can be customized so you can define the exact logic upon which an icon or set of icons should be displayed. You can display KPI’s in SharePoint by using the KPI web part (which exists only in SP2010 Enterprise edition, and no longer exists in SP2013/2016). The only way you can display KPI icons in your list views is by hard-coding it in the Data View web part or in calculated fields – both require development skills and effort. By using the KWizCom KPI Field Type you can easily and quickly display KPI icons/progress bars columns as part of your list views without any development. Easily & quickly visualize your SharePoint content using conditional formatting.